Creating and maintaining a safe work environment is the keystone of any successful warehouse and loading dock operation. The mixture of personnel and machinery in hectic, fast-paced environments means the opportunity for accident and injury is always present. However, a variety of Kelley products can improve environmental conditions and visibility and protect workers from dangerous situations. Powered or manually operated trailer restraints that secure the Rear Impact Guard (RIG) or wheels of the trailer are crucial to maintaining safety. Restraints that include interior and exterior LED lights improve communication for additional safety and security. Designed to withstand the impact of a 10,000-pound forklift traveling 4 mph, dock leveler barrier lips are an intelligent option to consider for some facility operations. 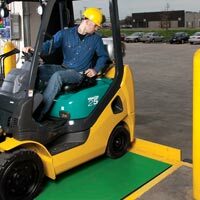 The lip is integral to the dock leveler and protects a forklift from rolling off the loading dock. In other cases, a barrier gate installed over the dock leveler and in front of the sectional overhead doors provides both a visual warning and actual roll-off protection. Minimize the opportunity for improper dock equipment operation or misuse and protect workers by interlocking products to operate them in a controlled sequence. Having one master control panel for operation of the entire loading dock bay can also ensure equipment is stored and doors are closed properly once loading or unloading is complete, preventing unauthorized entry. Recessed within a small pit just below the vertical dock leveler, this trailer restraint stores inside the building rather than on the exterior foundation wall of the building and keeps the trailer snug against the dock seal or shelter by securing the trailer’s RIG. In other applications, standard wall-mounted trailer restraints can be installed. Regardless of model, restraints should be installed with operating controls consolidated into a master control panel with other dock and door products. 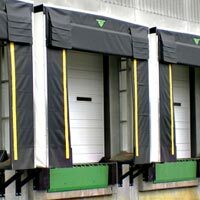 The proper dock seal or dock shelter for your application will ensure that the loading dock remains dry and safe from outside elements like rain, snow, and wind. Products such as the AquaShield® rain sealing system help prevent moisture from accumulating on your warehouse floor and provide additional sealing protection against the top of trailers, which is critical in facilities where a decline or recessed loading dock is present. 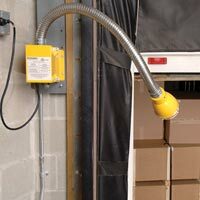 LED loading dock lights, especially impact-resistant LED dock lights, provide superior illumination into the nose of the trailer as workers enter and exit. Guardrails, door track guards, column protectors and other impact prevention products can add a further level of safety to your warehouse environment.